Evidence of the Vizsla can be found back as far as the 10th centry. The Vizsla was well in existence before any other versatile breeds, predating the Weimaraner by at least 300 years. It bears breed marks no other continental pointers possess and may have been the “model” which inspired the versatile breed movement in Europe. Prior to the 1800s, European hunters maintained a large collection of dogs – pointers to locate the game; setters and retrievers to retrieve it; hounds to trail quarry over long distances. Of course, the typical hunter of the period could afford that many dogs, for the sport was reserved for those wealthy enough to own the land on which to hunt. A large kennel of dogs was simply another accoutrement of the landed upper class. In Germany several breeds were developed for similar purposes, including the German wirehaired pointer, the German Longhaired Pointer and the Weimeraner. In France the Wirehaired Pointing Griffon and the Brittany were bred for similar motives. And in Hungary, the Vizsla reigned supreme, though mostly kept within aristocratic circles until the turn of the 20th centrury. Of all these breeds, a well bred Hungarian Vizsla is the most affectionate and beauiful. The Hungarian Vizsla is a source of great pride to Hungarian nationals. Hardly a child in Hungary was brought up without a Vizsla in the household and he was an indispensable weekend hunting companion. He is the beloved treasure and national dog of Hungary, and as such, is very dear to the hearts of the Hungarian people. This document is the most important document of the modern history of the Hungarian Vizsla. At least to those who care about the history of the breed at all. It was stored in Canada. No one knew – after the end of the 1960-ies – what it was all about, as it was written in Hungarian and put aside as one of the documents of no importance. Until 2010 – when by a pure chance – I was asked to tell what this letter was about. As soon as I read it, I knew this was what we Hungarians always referred to as the “missing link” of the Hungarian Vizsla History, the link we Hungarians always talked about and regretted we didn’t have. I realized immediately the utmost importance of this letter, as it identifies the old Hungarian Vizslas before and during World War II., the ancestors of our Hungarian Vizsla stock, we Hungarians thought were lost to us forever because all the aproximately 700 pedigrees of Vizslas disappeared after the World War II. Some say the pedigrees were “saved” from the Russians, some say they were simply stolen. Up to today the pedigrees are lost and there is very little – if any at all – hope they will ever be found, as the person who took them is no longer alive and he never revealed where the pedigrees were. Therefore, this is the most important document for all people seriously involved in Hungarian Vizslas as it identifies the ancestors of all Hungarian Vizslas today. Mihály Kende was a very important person during and after World War II within Vizsla circles. At the end of World War II our entire country became a battlefield. The landlords and their workers – who made the golden age of the Vizsla with unselfish, generous work, got into a situation when they were forced to try to manage their most necessary daily livelihood and could not think of hunting or re-newing the hunting with Vizslas. Most of the habitants of the country changed their addresses, moved around, and in this Hungarian wandering 80% of the Vizslas were lost. The majority of the remaining Vizslas were in un-knowing hands, they either died or were bred with other breeds. The dog breeding clubs were ceased. 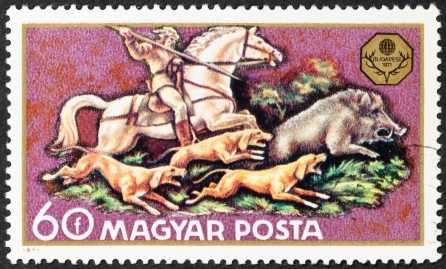 The Agricultural Ministry – when they reconstructed the country’s animal breeding – gave the registration of the purebred dogs to the Országos Törzskönyv Bizottság (National Pedigree Committee) and gave order of making the Magyar Ebtörzskönyv (Hungarian Dogpedigree). Most of the dog breeding clubs’ pedigrees were still in the country, so to continue the registration was possible. But the pedigrees of the Országos Vizsla Club Magyarvizslás Szakosztály (National Vizsla Club Hungarian Vizsla Sektion), – the datas of about 7000 Vizslas – were taken by the chief of those times registration, colonel Jenö Dús, to the West. He sent a letter to me in 1953 letting me know he was alive and I asked him during our correspondence to let me have the Vizsla pedigrees. He let me know he would make the necessary arrangements to send them to me. Unfortunately he died in a car accident without making the arrangements. This unfortunate circumstance made it even more difficult to identify the living Vizslas origin. So those excellent lines bred during the beginning: Végvári+Leányvári, Mesterházi – Vácdukai – Sabária – Kaposfüredi – Szikra (Kittenberger) – Miki (Lassányi) – Sashegyi – Hévizi – Palóc – etc kennels which gave not only to the Hungarian but also the Tscheckoslovakian and Austrian hunters those very good Vizslas; either were ceased or taken abroad. Only in very rare cases came an O.V.C (Országos Vizsla Club [National Vizsla Club]) pedigree into the hands of the registrator; those were copied and with the help of it they could identify the ancestry of some Vizslas. When the Agricultural Ministry started to register the dogpedigrees in 1947, only a few Vizslaowners knew about it, therefore only very few Vizslas were registered in the beginning. There was no club for the breed, which would control the breeding, so there was only manufacturing of Vizslas, not breeding. The Agricultural Ministry seeing that the lack of Vizslas made a great loss to find the shot game during hunting, started three Vizsla breeding farms: Malerd Vizslafarm in Hejöcsaba, Erdész Vadászkutya breedingfarm and Kiképzöfarm in Gödöllö and one in Bábolna, at the National Agricultural Farm. The Dogpedigree arranged a dogshow every year. The dogowners in Budapest gathered in the Micsurin Agricultural Institute’s dog section and started there the breeding of Vizslas again in 1952. At this time this dog section took over the organization of the dogshows. I took over the organization of the Gundogs subdivision of the Dog section and arranged huntingdog trainings every year. I tested the dogs first to see if they had ability so the owners would not have costs in vain. On these training courses I educated not only the dogs but the dog-owners too to hunt with gundog. The trainings were on Sundays on the territory of Pestszentlörinci Huntingclub, then I gave them the lessons for a whole week – showing them each moment – and letting the owners repeat it with their dogs and next week the gundogowners showed me the results of one weeks training. I succeeded to train some good gundogowners and hunters every year of those who were determined enough. The Agricultural Ministry allowed us to start our own club in 1955 and in January 1956 we started the Magyar Kutyatenyésztök Országos Egyesülete (Hungarian Dogbreeders National Society). In the gundog special section of this club gathered all the gundogowners and I became the president of it. The first bloodline is after Derby Winner and 2 x Winner male Puschi (Bogár x Lady Metternich), owner István Drevenka, engineer in Pestszentlörinc and Winner Vlada (Fickó II x Cánki Kacér). This pair had 12 puppies in 3 litters. Puschi even mated a female named Panni, she had 7 puppies. These were the 2. and 3. notifications in the Mv (Magyar vizsla – Hungarian Vizsla) pedigree. At this time Endre Félix and János Forti were still alive, both were certified judges by the O.V.C. (Országos Vizsla Club – National Vizsla Club), and they gave Puschi Derby Winner and 2 x Winner titles and Lada the Winner title. Both dogs must have inherited well because among their progenies one can find HPJ and DPY Winner and Hungaria Winner dogs. Later either one of them or both were in the pedigree of the majority of the Vizslas. The second bloodline was the Cánki kennel, owner dr. Alajos Gestettner, Kispest. This kennel was established already in the golden age of the Vizslas (1924-42). This inherited very well too, several HPJ, Derby Winner and Hungaria Winner males and females came from this breeder. HPJ, HDJ, Ö Hgy (örökös hungaria gyöztes – Eternal Hungaria Winner) male Cánki Pajtás mated 9 times and the 9 females gave 47 puppies. Winner Cánki Csibész under 1950-51 mated 3 females and had 17 puppies. The third bloodline was established by Eternal Winner Betyár (Cánki Pajtás x Bizsu), Imréné Hausmann, Budapest. He mated 6 females during 1956-58 and this bloodline gave 31 puppies. The fourth bloodline was established by Ripp (Winner Csibész x Lidi), breeder Jenö Becsei, owner Pálné Bartók, Budapest. This male mated 7 females during 1956-59. 42 offsprings were after him. He inherited very well, for example from the mating of Kati-Jutka from the litter Winner Csibi x Panni came HPJ, Derby Winner, Polish Winner, Eternal Winner, Cabib Csikcsicsói Apród and HPJ Csikcsicsói Ari-Nóra. This later ended up in Canada and got many awards there. Vizslas from these four bloodlines learned very easily and were good gundogs. Half of these progenies were owned by hunters. These hunters showed their dogs in one occasion each, but those who lived in Budapest and its surroundings showed them several times on shows. Unfortunately this caused that on shows Vizslas who were only pets won, because the hunters in the countryside were content with one judgment, they had no time and money for more. In the Spring those Vizslas which were applying for the hunting training we tested for their ability, but during those five years I led the training we only had to disqualify one Vizsla because he didn’t show any lust for hunting nor did he point the game. 8th of September 1956 together with the Magyar Vadászok Országos Szövetsége (Hungarian Hunters National Union) we arranged a trial for 15 Vizslas. Frici, male, owner Géza Katona, Falls Church, won the group of junior Vizslas with 97 points, and Diósgyör Jakab, male, owner Nándor Knefély, won the senior group with 139 points. The demand of the juniors was 100 points, and of the seniors 140 points. The Autumn happenings in 1956 (the Hungarian revolution, note from Katalin) disturbed the wellestablished system of the Vizsla breeding once again. Once again several Vizslas lost owners and depended of the goodwill of good hearted people. Because the new owners could not prove their ancestry, the Gundog Section ordered the judging of the looks and the hunting abilities of those dogs, and if they got “good” for the looks and “very good” for the abilities, they got a B pedigree with ancestors unknown. They became permanently registered from B pedigree if they proved with the puppies from two different combinations that the offsprings didn’t have any other breed’s influence. This was controlled by the breeding controllers and if they found the litters good they could suggest the parents’ permanent registering. The litters’ looks and abilities were controlled and judged again when they were at least eight months old and if the young Vizslas showed as good qualities as their parents, they were also registered. The above mentioned bloodlines had several side-lines, which all will be mentioned here down bellow. Harry (Eternal Winner Betyár x Nóra), owner Erzsébet Czinege, Budapest. This male mated 5 females and had 55 puppies. Very many of these puppies went abroad. Polish Winner, Eternal Winner, CACIB Csikcsicsói Apród (Ripp x Kati-Jutka) inherited excellently. This male with excellent features and prima working abilities mated 21 females during 1959-65 and got 100 puppies, among the puppies several got different kinds of titles. Very many puppies were taken abroad. Trial Winner Jakab (Csalán x Bakfis), owner Nándor Knefély, Diósgyör. This male mated 5 females and gave 22 offsprings to the Hungarian Vizsla people. He inherited his ability for hunting with hawks. The puppies were bought by hunters around Miskolc and they are all very pleased with them. Similarly good hunting bloodline is Sibriktelepi Aba-Betyár (Ripp x Fruska). He got 31 puppies from 5 females. These were also owned by hunters. Betyár II. (Eternal Winner Betyár x Zsuzsi), owner Sándor Regöczi, Budapest. This male mated 8 females during 1958-60, 47 puppies were after him. According to my observations the majority of those puppies which were born in 1960 had to loose eyelids. Among the ancestors of Zsuzsi were Végvári Betyár and Miki, both males priced with several titles and had excellent features and she carried their blood. Patkó (Czánki Csibész x Gegesi Csitri) owner János Uláh, Mezöhegyes. This male served the hunters in and around Mezöhegyes with Vizslas. In the years 1957-59 he mated 7 females and got 38 pupies. Sinriktelepi Pisti-Csibész (it is Sibriktelepi, it is merely a misspelling) (Csibész x Fruzsi), owner Pál Visnyovszky, Budapest, mated 9 females during 1958-64, with the result of 61 puppies. Szolnoki Picki-Muki (Harry x Kitty), owner Lajos Lukács Csernus. The owner raised this dog as a youngster with biotics and because of this he became 64 cm big. This male mated 31 females during 1958-63 with 146 puppies as result. Rex (Állatkerti Tomi x Csöpi Pansi), owner Jánosné Jánosi, Budapest. The owner got the dog during the events of 1956 and could not prove his ancestry, but because he had excellent features several females were mated with him. He got 27 puppies after 6 females. The star of István Homoki Nagy’s films, Fickó (Lurkó x Árgus) represents a new bloodline. Breeder and owner Kálmán Szigethy, Budapest. He mated 5 females with the result of 25 puppies. Derby Winner Hungaria Winner Dárdai Matyi (Harry x Dárdai Zsuzsi), breeder Béla Kerekes, Budapest, owner Szabolcs Harsányi, Budapest. A male with excellent features, well passed on the ability test, so far he mated 4 females with 23 puppies as result. Csavargó (Fickó x Leila), breeder Pál Szigethy, Gödöllö, owner Kálmán Szigethy, Budapest. This male mated 2 females five times and got 29 puppies. Édenkerti Csibész (Szolnoki Picki-Muki x Gyöngyi). This male, just as Szolnoki Picky-Muki, was raised with biotics and became even 2 cm bigger than his father, he is 66 cm. This male is also very used in breeding. He mated from the 13th of April 1961 to the 13th of January 1966 23 females and made the Vizsla stock richer with 125 puppies. Jogász (unknown ancestors), owner Gyula Paulini, Gyula. This male with unknown background must be a very good hunting dog, because the hunters in and around Gyula take their females to him to mate. He mated 4 females and got 20 puppies. Derby Winner, Hungaria Winner Pisti (Sibriktelepi Pisti x Rita). This male, as I heared, is a very welltrained dog, but he is not inheriting so well with every female. He has mated 11 females, 68 puppies are after him. Árokparti Morcos (Rex) (Eternal Winner, Polish Winner, CACIB Csikcsicsói Apród x Kati), owner Mártonné Szabó. This male mated 5 females, 17 puppies are after him. Derby Winner Hegyesdi Erdész-Fickó (Betyár II x Sibriktelepi Cili) has excellent abilities and he is a very good hunting dog. He has mated 7 females, 50 puppies are after him, he lives in Italy since 1965. Nagyerdei Adi Bitang (Ripp x Panni). Breeder László Rajnai, Budapest, owner Antal Szabados jr. Budapest. This male has mated 4 females, 24 puppies are after him. Anti-Kis Harry (Harry x Szolnoki Kitty). Breeder Erzsébet Czinege, Budapest, owner György Matuska, Solymár. He has mated 4 females, 17 puppies are after him. Tormáspusztai Fickó (Lurkó x Vica). Breeder Adrás Korecz, Pestszentlörinc, owner Róbert Kocsis, Pestszentlörinc. He has mated 4 females, 15 puppies are after him. Annavölgyi Szittya (Pacsirtai Bikfic x Zsuzsi II.). Breeder: István Borbély, Budapest, owner Budapest Zoo. He has mated one female 3 times and got 20 puppies. Egerhegyi Bicskás (Eternal Winner, Polish Winner, CACIB Kiscsicsói (misspelling, must be Csikcsicsói, Katalin’s note) Apród x Divat-Tücsök) breeder and owner Gusztáv Rudlof, Eger. This male has to to day mated 5 females and has 51 puppies. Engedelmes Csitt (Fickó x Leyla) breeder Ferenc Szalai, Dunakeszi, owner János Papp, Dunakeszi. Mated 5 females and got 23 puppies. Kerekegyházi Dani (Édenkerti Csibész x Kacér), breeder dr. Endre Király, Budapest, owner Iván Kisházi, Szentendre, Lajos-forrás. Mated 7 females, has 41 puppies. Zagyvaparti Bitang (Csavargó x Diva), breeder Pál Szigethy, Selyp, owner Zsigmond Párkány, Tiszaszederkény. Mated 6 females, 27 puppies are after him. Virányosi Pufi Filkó (Eternal Winner, Polish Winner, CACIB Csikcsicsói Apród x Csolnoki Lux), breeder Géza Paulovits, Budapest, owner Károly Zodoma, Györ. Mated 5 females, 26 puppies after him. Mátai Bohóc (Derby Winner Pisti x Dárdai Cili), breeder Miklós Farkasházi, Hortobágy, owner Budapest Zoo. Mated 5 females, from which he has 17 puppies. HPJ Derecskei Pandúr Puschi (Tószegi Durcás x Szamosi Dáma Gina), breeder István Drevenka, Budapest, owner György Boros, Újpest. Mated 3 females, 15 puppies were born. HPJ Hungaria Derby Winner Borvidéki Nimród (Eternal Winner, Polish Winner, CACIB Csikcsicsói Apród x Árokparti Dáma) mated 2 females. There are 13 puppies. I have seen one of his litters, wonderful 5 males, 1 female. HPJ Hungaria Winner, Best of his Breed, CACIB Nótás (Édenkerti Csibész x Csibi Böske) breeder and owner József Vasas, Miskolc-Tapolca, so far he has not mated. Winner Vlada, breeder dr. Alajos Gestettner, owner István Drevenka, Pestszentlörinc, (Fickó x Cánki Kacér) had 12 puppies. Cánki Sári (Fickó x HPJ Hungaria Winner Cánki Kacér) had 4 puppies. Winner Cánki Kacér (Zsivány x Kati), breeder Alajos Gestettner, Pestszentlörinc had 8 puppies. Winner Bözse (Winner Puschi x Winner Vlada), breeder and owner István Drevenka, Pestszentlörinc had 5 puppies. Kati-Jutka (Winner Puschi x Panni), breeder Gyula Hess, Budapest, owner Jánosné Jung, Budapest, had 13 puppies. Dorka (Winner Puschi x Winner Vada), breeder István Drevenka, Pestszentlörinc, owner Béla Kerekes, Újpest. Had 16 puppies. Szolnoki Kitty (Pisti x Tündér Lidi), breeder and owner Erzsébet Czinege, Budapest. 19 puppies. Winner Dárdai Zsuzsi (Winner Fickó x Dorka), breeder and owner Béla Kerekes, Újpest. Had 18 puppies, mostly were taken abroad. Hargitai Réka (Néró x Zsazsa), breeder Lidia Kéri. 18 puppies. Dárdai Vica (Winner Betyár x Dorka), breeder and owner Béla Kerekes. Had 23 puppies. Hungaria Winner Hargitai Ancsa (Hungaria Winner Betyár x Hargitai Réka), breeder Lidia Kéri, Budapest. 18 puppies. Hungaria Winner Dorka (Eternal Winner Betyár x Plutó), breeder Zsigmond Virág, Pestszentlörinc. In this female there is the blood of Végvári Betyár and Eternal Winner, Champion Niki. Had 16 puppies. Sibriktelepi Cili (Aba Betya – Dárdai Bori), breeder and owner József Farkas, Budapest. Most of her puppies are in Greece. She had 14 puppies. Sibriktelepi Miss (Csibész x Frucsi), breeder József Farkas, owner Antal Gmeiner, Esztergomtábor. Had 16 puppies. Hungaria Winner Divat Tücsök (Fickó x Leyla), breeder Ferenc Szalai, Dunakeszi, owner Gusztáv Rudlov, Eger. Had 21 puppies. Sibriktelepi Beri (Sibriktelepi Aba Betya x Dárdai Bori), breeder József Farkas, Budapest, owner Iván Kisházi, Szentendre. Had 11 puppies. She became one of the founding females of the Lajos-forrási kennel. Zsóka-Mici (Harry x Mici), breeder Erzsébet Czinege, Budapest, owner Gézáné Szigethy, Budapest. She gave birth to 16 puppies. Tardosi Cili-Ara (Szolnoki Picki Muki x Derby Winner Csikcsicsói Ara Nóra), breeder Lajos Dudás, Budapest, owner Sándor Miklós, Budapest. Had 21 puppies. Högyészi Szimat (Csavargó x Dorka, breeder Kornél Kiss, Högyész, breeder Sándor Berek, Tengelic. Had 22 puppies. Csolnoki Lux (Báró Caró x Lady), breeder András Heltai, Budapest, owner Géza Paulovits, Budapest had 20 puppies after Csikcsicsói Apród. Diva (Fickó x Leyla), breeder Pál Szigethy, Selyp, owner Kálmán Szigethy, Budapest. Had 26 puppies after Csavargó. Högyészi Szilvia Zsóka (Csavargó x Dorka), breeder Kornél Kiss, Högyész, owner Budapest Zoo. There are 20 puppies after her. Szamosi Dáma-Gina (Csikcsicsói Apród x Csibi), breeder Lajos Szinák, Budapest, owner István Drevenka, Pestszentlörinc. She had 22 puppies. Jakabhegyi Linda (Peti x Hévizi Bori), breeder János Szurka, Pécs, owner Ádám Gép, Pécs. Had 8 puppies. Derby Winner, Hungaria Derby Junior Tardosi Pletyka (Hegyesdi Erdész Fickó x Tardosi Lili), breeder Lajos Dudás, Kispest, owner György Jelenka, Miskolcs-Tapolca. She hasn’t got any litters yet. Hungaria Winner Lotti (Zsivány x Högyészi Szimat), breeder Sándor Berek, Tengelic, owner Bertalan Berdók, Bátaszék. She has not given birth yet. CACIB Ujvárosi Dóra-Pletyka (Bodrogközi Ádáz x Szidi), breeder dr. Ferenc Saád, Miskolc, owner György Jelenka, Miskolc-Tapolca. Had 7 puppies so far. Hungaria Derby Winner Fabiánsebestyéni Fruska-Kati (Édenkerti Csibész x Kati), breeder Jenö Kába, Budapest, owner László Pauliny, Budapest. 1 liter, 2 puppies. HPJ Magyarkuti Tünde (Édenkerti Csibész x Mezöfalvi Lady), breeder Gusztávné Szabó, Budapest, owner Dezsö Rigó, Budapest. The female is still young. To develop the breeding we miss trials very much. We haven’t had trials for 10 years. Therefore the owners of the females had no help when they chose the male to mate with. Very many dogs with very good ancestors (as for example the Végvári and the Leányvári kennel, Szikra (Kittenberger), Miki (Lassányi), Sabaria, Vácdukai, Kaposfüredi, Hévizi, Sashegyi, Palóc kennels were not used in breeding, they got too old and died without offsprings. But there were dogowners, who managed to get to many females to their un-priced males which were not exceptional in their looks nor in their abilities. This year in every district the Club will arrange trials, the 3 best dogs in the district trial will start on the national trial, this way many males will be studs and we can diminish that people mate females from Tiszántúl to males from Dunántúl and visa versa. Those owners who are no hunters we will try to force to train their dogs or have them trained and the special section will also give everybody opportunity to get the dogs hunting skills, so with the natural selection the Vizsla breeding will get to the high level it was before. The goal of the special section is to allow registration of puppies only after parents which both are hunting or have hunting test. This can be achieved in 3 years, and we can go over to this method without any problems. I mention also the owners of the kennels in pre-war time, maybe you can find those in the pedigrees of the to Canada imported Vizslas and you can get some help to find out the bloodlines. 1-2. Végvári or Leányvári kennel, owner Károly Bába, Battonya. The change in the kennelname occurred when the owner moved. The kennel has ceased to exist because of the death of the owner. 3. Kaposfüredi kennel, owner Kálmán Polgár, Kaposvár. Ceased because of the death of the owner. 4. Progenies of Szikra and Szidi without kennelname. Owner Kálmán Kittenberger, Nagymaros. The kennel ceased at the death of the owner. 5. Progenies of Böngér and Miki without kennelname. Owner József Lassányi, Debrecen. The kennel ceased to exist at the death of the owner. 6. Vácdukai kennel. Owner Count Miklós Serény, Vácduka. The owner moved abroad. 7. Sabaria kennel. Owner Albin Lékai Lingbauer, Szombathely. Owner died, breeding has ceased. 8. Sashegyi kennel. Owner Mihály Kende, Budapest. All of the dogs were killed under the siege of Budapest. 9. Hévizi kennel. Owner prince Festetich and his estate in Keszthely-Héviz. The estate was disbanded, the owners left for abroad. The Vizslas were all taken by the personal of the estate. 10. Palóc kennel. Owner Jenö Dús, Buffalo, USA. He died in a car accident. His son inherited his dogs.